The CFM00003B, what a neat looking watch! Appears to multi-task well while never looking cluttered. It definitely woud make a great every day watch! Thanks for putting on this contest. I think I enjoy the dial the most on the CFM00003B. It has good visibility, isnt too crowded, and I like how the date is displayed. I would wear this watch and that is high praise. 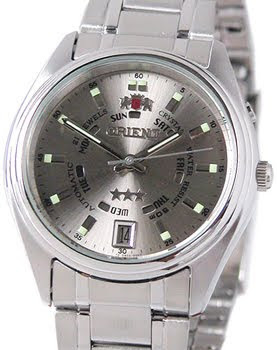 Orient has always provided the "bang for the buck," in automatic watches. Although the CFM00003B is multi-function, it's easy to read and looks like a fun watch to wear. I've been pondering getting one of these. I like the combination of the orange bezel and the leather band. I have one on an Orient Power Reserve that I really like. I could wear that watch with a suit to work or in casual situations. It's a good "general purpose watch." its the unique classy 'planet ocean' design, value for money. best of all, movement definitely on par with a swiss movement. an orient for me on any day. Love that watch, the orange trim really gives it some style, yet the overall look is still very professional. I would wear it to work, travel or just about anywhere. This would be a great watch for my husband. He loves leather bands, and this is just sporty enough for him. Thanks for the chance to win it! Really like that CFM00003B, a very retro looking watch. I like the orange accents & the power reserve & a display back is always a plus. I also think it would be a great daily wearer, but would be especially nice on the days I take the car out to the track! Looks like a great watch that could be used everyday or for an evening out. Slightly understated, but classy! I love the circular repetition because it reminds me of ripples on a pond. The three-tone color configuration is great because it's classic and simple. I'd wear it in any situation, whether it be with a suit or hiking in the mountains. Thanks for this opportunity. Reminder guys, your Email addy must be in the post for us to contact you if you win! I really like the the CFM00003B because it is a versatile watch. I think you can wear it as an everyday watch but it is also dressy enough to wear to work or more formal ocassions. The styling reminds me a little of a Planet Ocean, but without being a copy. Perfect size and just enough orange color to make it pop without making it too casual. That definitely makes it a home run. Plus, this watch has a power reserve complication and intereting date wheel - all for an amazing price. Hard to find a better looking watch with these features for a lower price. What I like about the CFM00003B is the contrast in colors, the power reserve (still don't have one at present) and the sporty look. I love the power reserve indicator. I think it is one of the most important features on an automatic. I think this watch is great for out door activities, but I would definitely wear it on Halloween. Ahh yes, the Planet Orient. And the leather strap version to boot! My personal favorite combination. Deployment leather straps are so nice, and the 2 tone is perfect. Personally, it would sit right above my calf-skin driving gloves while clutching the Mk.9 Mahogany wheel of my 75 MGB while zipping up the curves of Lookout Mountain basking in the Colorado sun. Not a bad way to spend an afternoon. What a cool watch. Great face design and good use of color. I think it could be worn daily! I like the CFM00003B in that it is a unique design without being overly cluttered. I think it is dressy enough to wear every day. Thanks for the chance to win. Wonderful contest and gesture, thanks! This would be a great watch for my son, he has been wearing a Seiko 5 automatic and is really beginning to appreciate mechanical watches. What a great watch! It's sporty and classy. The orange tachymeter meets my need for an orange watch. It would definitely fit in as a daily wearer! I like the way the power reserve and calender are done. I would wear this one as a casual fun watch. I really like the orange bezel and orange hands. The subdials are nicely sized too without looking cluttered. This would be a great daily wearer. The first mechanical watch I purchased was an Orient Black Mako, and it is the one that started my obsession with watch collecting. Id don't get much more formal than divers, so the CFM00003B would be an ideal dress watch for me; interesting day and date displays on a strikingly handsome dial. I like the symmetry between the power reserve and date indicators, the contrast between the orange indicators and black dial, and the sleek cleanliness of the stainless case and bezel. This watch says ACTION to me in every way. I would definitely wear this watch with pride at any sporting event. The screw-down crown and bezel are great for diving. But what I like best about this watch is the FREE surprise gift that comes with it! It gives the watch a sense of adventure even before you wear it. The thing I like best about this watch is the POWER LEVEL indicator. I would wear this watch when traveling. this is such a neat looking watch. I have never really seen orient watches for I spend more time looking at swiss watches I will never be able to afford but the movement looks to be of superior quality and so I would have to say the automatic movement would be what appeals to me most! This watch looks like a great watch to wear on fancier occasions and so for me it would be my dress watch! But could definitely be an every day wearer as well! Love to be an orient owner someday! What a great looking watch! I can invision it on my wrist at baseball game. Orient has always intrigued me. It would be a great addition to my collection. Work or play this Orient can be worn with confidence and pride. The cfm00003b-another classy step in the right direction for Orient. I like it. The face is very distinctive with it's power reserve indicator. Overall, it has a sporty/trendy look without looking like it's copying anyone. Well done. It splits the difference between a sports and dress watch without looking as if it's compromising at all. That's a great look! The CFM00003B is a very classy looking watch. It is at home with a suit or casual wear. I like the rugged look & the very technical style of the dial. This is an every day wear watch for me. Very high quality! Another reminder to post your email address, otherwise your entry would not be considered even if we love your post. The reason is we would not be able to contact you for the prize if you win. Really great looking watch! My favorite thing about it has to be that neat day date function! Never seen anything like it! This would be my ideal dress watch, something that can be talked about while at a special occasion! Hope i win! Always wanted an orient! This orient watch is unlike anything ive ever seen! The silver dial is gorgeous and the automatic movement makes it that much cooler. Definitely an every day wearer in my book. Thanks orient! I am seeing these Orient watches everywhere these days. I really like the sporty look, but it's dressy also. The orange trim gives it a unique and somewhat sassy appearance, while the leather band is an all-time favorite. I'd love to own it! Thanx people, the contest has ended, pending results.